My favorite domestic flights are those on American’s Boeing 767s between New York and San Francisco. One of the reasons I like them, is that I think that they offer a great opportunity to use some of your AAdvantage Miles and maximize your redemption value when you upgrade to first or business class from a deeply, discounted ticket. For 15,000 miles and a $75 co-pay you can upgrade to the next class of service. It’s almost a six hour flight, and the one-way fare difference between the cheapest coach fares and first or business class is often between $1,500 and $2,200, so you’ll “earn” about 10 cents of travel value per mile. Unless you’re traveling internationally, it’s a challenge to get that kind of return on your miles. You’d be hard pressed to redeem 12,500 on a domestic MileSAAver award and earn more than 2 – 5 cents per mile, so the mileage upgrade is a pretty good deal. And did I mention that it’s a six hour flight? Between JFK and San Francisco, American uses two-class configured 767-300s and three class configured 767-200s. My preference is business class on the 767-200. Most people would probably prefer the larger, first class seat on the 767-300, but on the 3 cabin 767-200, American offers wifi and their Transcontinental Flagship Service. Aside from the wireless internet and watching movies on the complimentary Samsung Galaxy tablets, American’s Flagship Service is like a throwback to another era in domestic air travel: printed menus with enhanced dining options, a long wine list, and made to order ice cream sundaes. I’m fond of it for nostalgic reasons. I guess that I’m a history geek. And it’s for this reason, that on this route I never fail to think about, and appreciate, the fact that I’m able to make the journey between these two cities, across this huge continent, over immense plains, and the Rocky and Sierra Nevada mountain ranges, in just a few hours. It’s a shocking accomplishment of human effort that in 160 years we went from stagecoach to an airline offering four flights a day. So Sunday I was traveling on AA 179 and enjoying the flight (thanks to Henri and the great crew) and I started to think about all this. And out of curiosity, I did a little research. • Back in 1876, the Transcontinental Express made a publicity run to demonstrate the speed of travel along the first transcontinental railroad. • In 1929, Transcontinental Air Transport (which would go on to become TWA) introduced a hybrid of rail service and Ford Tri-Motors to transport passengers from New York and San Francisco in just 48 hours. • And from this page in a 1953 American Airlines System Timetable, there’s an express flight with only two stops (one in Chicago and another in Los Angeles) before completing the 12 hour and 25 minute journey in a Douglas Aircraft DC-7. This was the last turbo prop large, piston engine, propeller-driven aircraft to be added to the American Airlines fleet. The next big order for aircraft happened just a few years later when American ordered the Boeing 707. 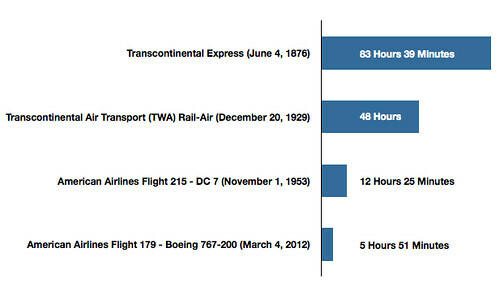 • And then there was my trip Sunday, on American Airlines Flight 179, a big 767-200: 5 hours and 51 minutes. If I could travel back in time so that I could travel back in time, my first stop would be 1929…..I’d love to take a ride in a Tri-Motor. Where are you getting $75 copay? Looks like their site says 15k + $150 each way. What am I missing? I’m glad you asked the question, I probably should have linked to the chart. Thanks for reading! Great write up, thank you. We have a JFK-SFO on AA coming up, I will appreciate it even more now. The Douglas DC-7 was the last major piston engine powered transport made by Douglas Aircraft. It was not a turbo prop. I love history geek stuff like this, it’s really incredible how far things have changed in such a relatively short time. I just wanted to make a clarification to your readers that they will get the special “Transcon Flagship Service” regardless of if they fly on the 762 or 763. The seats on the 763 are the NGBC seats (same as on the 777) so I MUCH prefer those versus the old “cradle” seats on the 772. You are correct in noting that the 762 offers WiFi however, while the 763 does not. Personally, I’d rather have the better seat (esp. for redeyes or night flights), but for getting work done, it may be better to have WiFi. @ PedroNy – I’m glad you enjoyed. Hope you enjoy your transcon flight too! @ PanAm – Glad you enjoyed it. Historical comparisons are interesting. I like your idea, the next history “episode” will be about trans-Atlantic or trans-Pacific travel. Thanks for reading! @ Scott – I don’t disagree, the 763 does have the more comfortable seat and I’m a big fan of the NGBC seating. As for “Flagship Service”, I haven’t been on the transcon 763 since 2009, but from my memory, they didn’t offer the menus or the ice cream sundae cart. But then it’s been a couple of years, and I’ve been on a lot of plans since then, so I’m probably wrong in my recollection. Thanks for the comment! AA have never offered the 763 on the SFO -JFK redeye which is crazy IMO. They fly that on morning flights. Sigh.